If you’re planning a business or social event near Lake Pontchartrain, the Country Inn & Suites, Covington, LA offers the ideal venue for up to 40 guests. Our meeting room provides free high-speed Internet, and you can request a complimentary television and a projector screen. 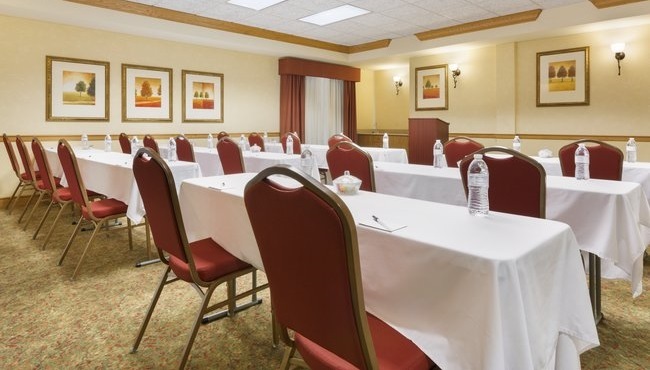 Our meeting room is conveniently located north of New Orleans, and our dedicated event staff can recommend local restaurants or attractions for your guests to enjoy. Celebrate weddings in the New Orleans area at the Country Inn & Suites, Covington, LA. We welcome wedding guests from out of town with amenities like an outdoor pool, free high-speed Internet and a free, hot breakfast. Book your rooms on a private page and enjoy special group rates. With a group reservation of at least 15 rooms, the bride receives a complimentary room and a gift certificate for a pedicure at Stone Creek Club & Spa, located less than five miles from the hotel.